Products not meeting the specifications must be ejected from the production process at an early stage to minimise costs. That’s where we come in. We offer more than accompanying manuals … because there is a human behind every machine. We’ll be at your side as a competent partner. Our product range encompasses small manual testing devices for random tests during production flow to the electrical equipment of fully automated production lines with an integrated final test stand, whereby we place great emphasis on precision during every partial step and accompany the process from planning to maintenance. Our customers are suppliers and manufacturers in the automotive industry, in the production of household technology as well in robot technology. We work on an international basis – e.g. in England and Scandinavia. 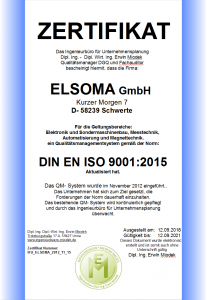 Elsoma currently develops and produces customer-specific testing, measuring and automation technology for the most varied of sectors, whereby we always remain faithful to our own claim to excellence.